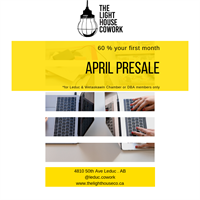 The Light House Cowork is opening in Leduc in May and for the month of April we are offering a 60% discount on ALL memberships for your first month. This 60% off promotion is valid for Chamber and DBA members ONLY. To learn more please email hello@thelighthouseco.ca or call Amber at 780-266-9736.